In fun-loving Thailand, even the seasons are vulnerable to a little bit of sanook. While most people consider April as the showery middle of springtime, here in the Land of Smiles it’s called summer. School’s out, the heat cranks up, and so do the opportunities to enjoy a happy vacation. 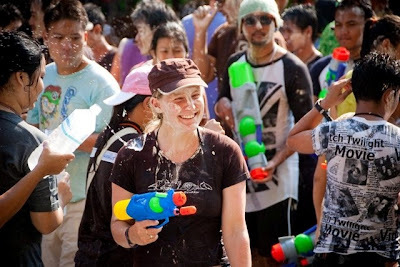 Any account of the Siamese summer would be lacking if it didn’t mention Songkran, the Thai New Year festival marking the traditional calendar’s “astrological passage”, which is celebrated by dousing with water anyone within splashing range. Observed nationwide during the hottest part of the year, the holiday is famous for people wandering the streets carrying containers of water or water guns like dripping-wet soldiers, or simply settling themselves down at the sides of roads and intersections with buckets and garden hoses, soaking each other and passersby with glee. If wet and wild is your idea of a good time, then this time of year is perfect for visiting any of Thailand’s seemingly endless selection of beautiful beaches. 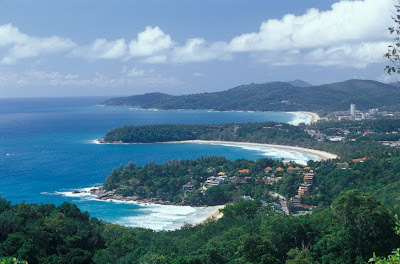 Phuket is the world-renowned resort destination where holiday-goers can relax amid picturesque white sand beauty, head out on the crystal clear Andaman Sea for a snorkel or scuba trip, and enjoy a seemingly limitless array of great food and nightlife. The best thing about the early summer months in the islands, April and May, is that it’s the “low season” for visitors from many Western countries. Hotels and restaurants run promotions and things tend to be a bit cheaper and less crowded. But shhhhhhh, that’s between you and me. For an even more laid-back beach experience in low season, head to another Andaman island, Ko Lanta. The reduced number of travellers visiting there in summer means they are rewarded with long stretches of beach to themselves and the serenity of an uncrowded island paradise, and while the island 'slows down' around the end of April each year because of the oncoming green season, it is possible to enjoy weeks at a time with little or no rain. Roughly 80% of the population there practices Islam, and fishing and chilling on the beach are a way of life. Due to this Muslim influence, the local cuisine is based firmly in Malay and Indian traditions. Local favourites include southern-style dishes like Muslim curry (massaman), rice noodles in fish curry sauce (khanom chin), and chicken birayani (chicken on yellow curried rice). A distinctive Southern dialect of Thai is spoken there, and the Old Lanta Town is rich in history, local customs, and traditional festivals. A popular summertime activity in Thailand is the Chiang Mai Night Safari, one of only a handful of nature parks of its kind, and a unique sight for people of all ages. Many travellers familiar with this type of theme park consider Chiang Mai’s the most beautiful Night Safari in the world, plus, in summer, any nighttime excursion offers a welcome respite from the daytime weather. The Night Safari is basically an aesthetically pleasing zoo set out like a theme park, with the animal viewing separated into three main areas: the Jaguar Trail, featuring a 1.2km walking trail which provides glimpses of a wide variety of exotic mammals and birds; the Savanna Safari and its 300+ animals covering everything from white rhinos to kangaroos; and the Predator Prowl, where the big hunters roam. For those looking for big-city action, you can beat the heat by sampling Bangkok's superlative selection of A/C-chilled shopping malls. All the leading international brands are available in places like Siam Paragon and Gaysorn Plaza, which emphasize fashionable luxury living and host a wide selection of registered dealers of top names like Gucci, Louis Vuitton and Tiffany, among others. 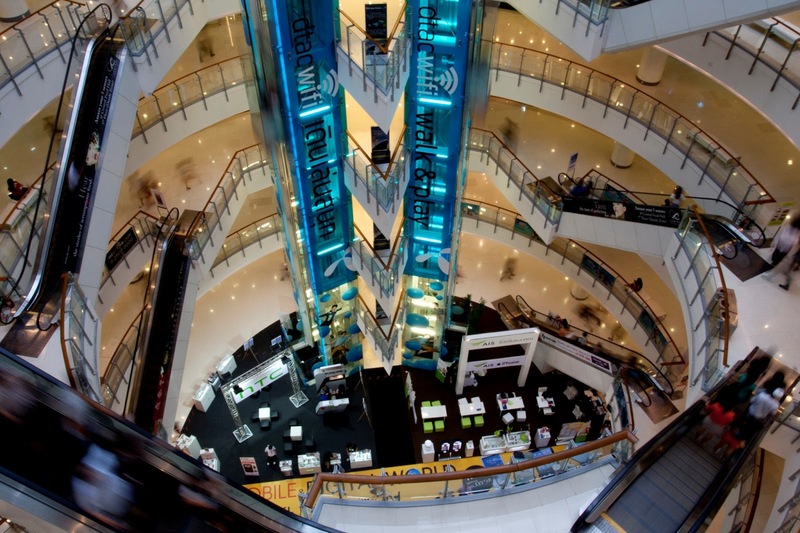 In nearby Ratchaprasong, the Central World and Central Chitlom malls provide an oasis with the former hosting nearly 500 shops which are highly popular among affluent Thais and expats. The other main downtown shopping destination is the Sukhumvit area, with Terminal 21 and Emporium, both also easily accessed by Bangkok’s convenient Sky Train system. Terminal 21, a “Market Street” theme with an international flair, is a 9-floor complex with each level named for an international destination like Rome, Tokyo or Istanbul. So, for anyone interested in a world-famous festival, beautiful uncrowded beaches, outdoor wildlife, and a shopping paradise, summer in Thailand might be the thing to do this spring!